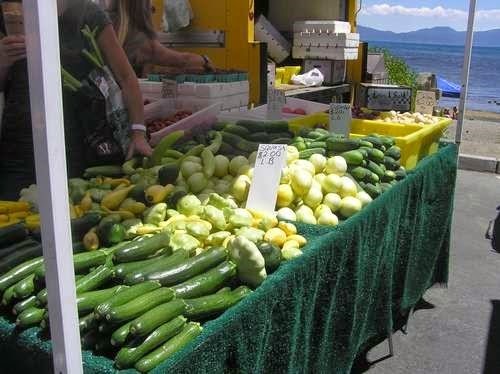 Farmer's Market in Tahoe City--on the Lake! Well, it's zucchini season and the tables at my local farme'rs markets were laden with it this week. If you're growing it in your garden, you're probably ready for some good zucchini recipes to help you deal with the surplus. My husband loves zucchini and all the summer squashes. He's often begging me to serve them for dinner. Most nights, I just prepare them simply and let their natural flavors stand out. 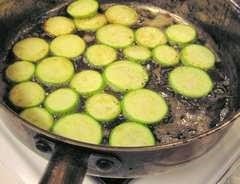 For zucchini, I slice it thin, sauté in olive oil until slightly golden and then splash on a little fresh lemon juice and maybe sprinkle on Parmesan. Fabulous! For the crooked neck and patty pan squashes, I cut them into bite size pieces, toss them into a sauce pan and simmer them in about an inch of water. When they are tender and drained, I add a little butter and Jane's Crazy Mixed Up Seasoning Salt (available at Trader Joe's) which, for some reason, really enhances their flavors to the max. So simple, and yet, really undeniably delicious! Do I have squash recipes for special occasions? Of course I have some tried and true recipes that I've collected over the years! These are all winners and you can confidently serve them to guests. Or, if your zucchini cup runneth over and you're simply looking for new ways to sell yet another squash dinner to the family, these recipes are sure to please. This is a recipe I have been making since the 1980's and everyone always loves it. It is even prettier if you mix both green and yellow zucchinis. 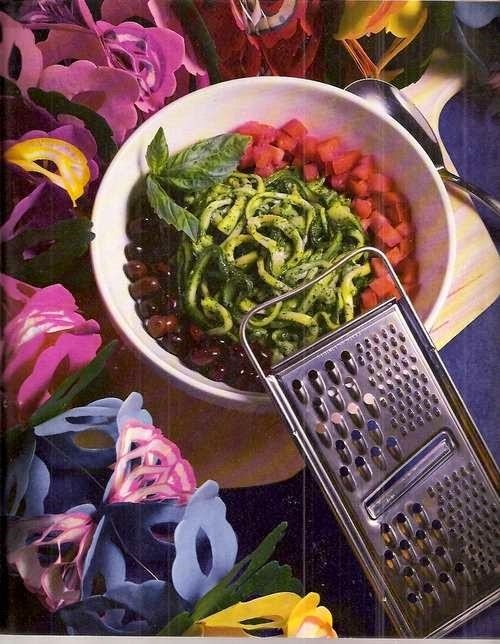 The recipe comes from "Great Cooking--The Best Recipes From Time Life Books". By the way, my Slow Food cooking group is planning an Italian night dinner next month and I have been asked to create the menu. You can be sure that this recipe will be included. To prepare the sauce, first combine the basil leaves, Parmesan, garlic and 1/4 cup of the olive oil in a food processor or blender and purée. With the motor running, add the remaining oil in a slow, steady stream, and process until the sauce is smooth. Sprinkle in lemon juice, a drop at a time, to taste. Add a few grindings of pepper, then transfer the sauce to a large serving bowl. Squeeze the zucchini dry in paper towels. In a heavy 10-12 inch skillet, melt the butter over moderately high heat. When the foam subsides, add the zucchini and sauté for three to five minutes or just until tender. Add the zucchini to the bowl with the sauce and toss together gently but thoroughly. Taste and adjust seasonings. Cool the zucchini and serve surrounded by the tomatoes and olives and garnished with a basil sprig. This wonderful recipe comes from Alice Waters. I have prepared it with yellow crooked neck squash and topped it with bread crumbs and Parmesan, adjusting the cooking time to over an hour. Peel and slice thin the onion and sauté it in olive oil until soft and translucent. Season with salt and pepper; add the leaves of the thyme and basil, stripped to their stems and chopped. Cut out their stem ends and cut the tomatoes into 1/4 slices. Trim the zucchini and cut them into 1/4 inch thick slices on the diagonal. Spread the onion and herbs on the bottom of a 9 x 12" gratin dish or glass baking dish. Make a row of partially overlapping tomato slices. Season lightly with salt and pepper and if the tomatoes are not very sweet, with a sprinkling of the balsamic. Overlap the first row of tomato slices with zucchini slices, season with salt and pepper, and drizzle with olive oil. Continue making alternate rows until tomatoes and zucchini are used up. Press down on the vegetables slightly, drizzle a little more olive oil over, and bake, uncovered for 30-45 minutes until the vegetables are fully cooked and the gratin has started to brown. If the top appears to be drying out while it bakes, tip the dish slightly and collect juices in a spoon to moisten the top. This is a recipe of my own devise. 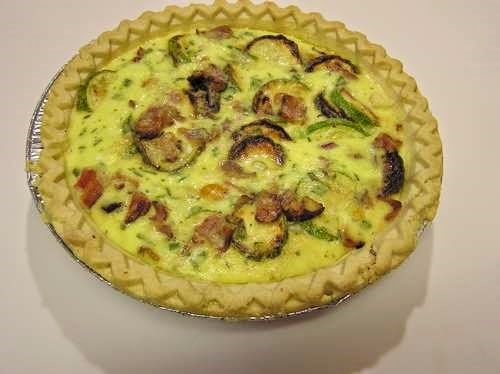 I like to buy the Whole Foods brand gluten-free crusts to make this an easy meal, but if you like to make your own crust, I recommend the Gourmet Magazine standard patê brisée recipe which I have used for all my homemade pie crusts, for years. Debbie, by the way, prefers the Silver Palate pie crust recipe which I think is also very good. Sauté the bacon until crisp and remove from pan. Add the sliced white onion to the pan and sauté until tender. Remove onion and add zucchini to pan and sauté in remaining bacon drippings. Mix together beaten eggs, buttermilk and cream. Add sliced green onions, yellow tomatoes, rosemary, bacon and sautéd onions and zucchini. Pour contents into crust and bake until firm.